B4Bikes is founded by the Dutch artist Janpeter Eilander, who has had this dream since his childhood. He stopped philosophizing and start acting on the realization of the electric bike of his dreams, to make the world a more beautiful, playful and sustainable place. After three years of extensive development in the fields of design, technology and production, the B4 Bike E-cruizer is one of the superior models in the electric bikes industry. 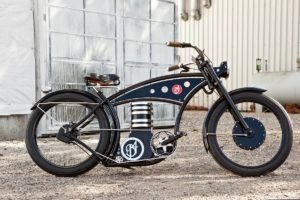 This cruiser is an hand-built electric bicycle, inspired by the design aesthetics of a 1912 Harley Davidson. This E-bike is not only stylish and cool, but nostalgic and fashion forward as well. You are able to reach a distance up to 200 kilometers, on a fully charged battery. Visit their website for more information about this brand.